Peter on Crystal Meth. 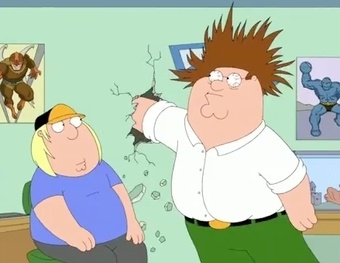 When Peter tries to get to know Chris's interests he snorts up Meth and punches a hole in his wall. Causing his hair to stick up and his eyes turning red.. Wallpaper and background images in the uma familia da pesada club tagged: family guy peter chris crystal meth hole in wall funny weird hilarious.